We weren’t finished yet, you or I, when we said those vows. You stood there, green before the crowd and I beside you quivering like a leaf in the breeze. We thought we knew what love was, but we didn’t. And in this unfinished state, we grow up into love. We grow into each other and around each other and we are two tree trunks wrapping our bark right into the flesh. Sometimes we fight the pressure to bend or be shaped and yet most of the time, we do, ever so slightly, shift to the right or to the left. You grow up into me and I into you, grafted together producing a new varietal. I wonder…is it the sort of tree that will feed you? The children? This church? Our own souls? Can you (can they) gain sustenance by the way we mold into one another? And still, even now, ever more, it is my job to put my own roots down deeper to find my joy in the Living Water beneath this ground. Both of us, unfurling branches towards the Sun, feeding ourselves on Pure Light. Suddenly, we are moving in the same direction as we grow out from the shadows. Somehow easier, when we are growing the same direction. We almost soften…though we both know, only the God of the trees could bend either of our hearts. And you. How you grow each year, a ring around the sun, and where I thought I knew each notch, each scar, you prove me wrong and you somehow produce a fruit I’ve never seen. After all this time, I still don’t know you. It is the joy and the curse…this tree bears both. And in the growing sap will bleed. And in the pruning whole branches will fall, rot. We trust the one who tosses them into the fire. For you, I will seek to provide shade to rest in. Food to sustain you. And perhaps? I might even bend some days. But only for you. And only by His Grace. This entry was posted in FAMILY, Marriage and tagged Fruit, Marriage, Tree by melissafed. Bookmark the permalink. This is simply beautiful. I just found you yesterday at Amber’s and began to “follow.” Such a joy to meet you. YES! Excited to read at your place too! stubborn as an old oak am I…Thanks for stopping by! Your blog looks lovely too and look forward to spending some time over there! This is a beautiful post, and a fascinating photo too! mmm, this is lovely. what a portrait of marriage and grace. 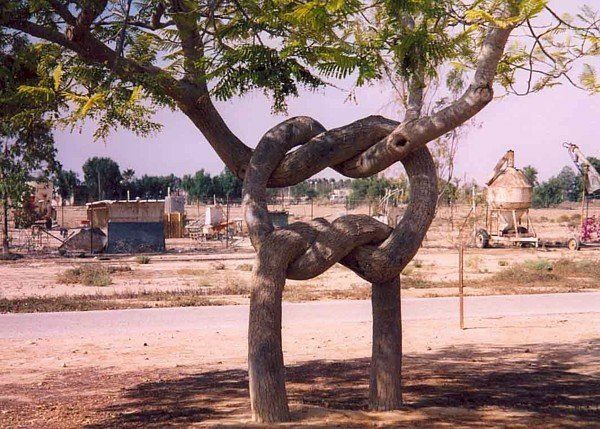 I love the image of the knotted trees. You couldn’t pull them apart now without irreparable damage. How easy it was to join them together in their youth. And now, they are strongly bound. I wish I knew more old marriages and heard less children say, “my parents are divorced.” God bless you. Oh I like that! Thank you for visiting! Such a graphic picture of what real marriage can be. Love the post and the picture! You grow up into me and I into you, grafted together producing a new varietal. oh girl. you’ve spoken marriage to me in a way i hadn’t heard before. thank you. Your word pictures of marriage are beautiful. Roots growing deep into Living Water finding joy. I love that! I too know the necessity of reaching for the Living Water to find grace and mercy in times of need, especially in the committed life of marriage and growing together. Thank you for the lovely challenging thoughts you’ve given me to think about this morning!